As improbable as it may sound, Frank Sinatra is the man of the moment. Sixty-four years after he became a star and five years after his death, Ol' Blue Eyes is everywhere. On Tuesday, Radio City Music Hall announced that a multimedia show featuring Sinatra on huge screens, live musicians, a gospel choir and the Rockettes will premiere in October. Hart Sharp Video also issued a new DVD - a compilation of duets, mostly from his late 1950s TV series and specials. Last week, Sinatra's longtime valet published his memoir. A suburban New York PBS station drew big pledge money with a special featuring a Sinatra sound-alike. And New York's Metropolitan Repertory Ballet performed a tribute to Sinatra that it hopes to take on the road and bring to television. "My God, you can't walk through an airport without hearing a Frank Sinatra song. 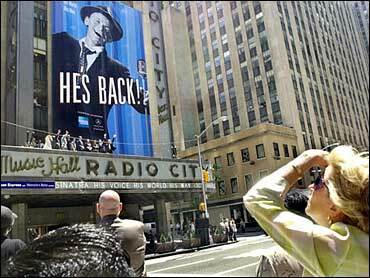 He's absolutely everywhere," said two-time Tony-winning director Des McAnuff, the Radio City show's creative director. And Sinatra can still stop traffic. In unveiling a four-story-high banner above Radio City's marquee, police halted everything on Sixth Avenue in midtown Manhattan so people could stand on the street, sing along and let confetti rain down on them. Why all this ring-a-ding-ding, now, about The Voice? His youngest daughter, Tina, noted that his record sales are as high as they've ever been. "He's a part of our culture," she said, standing in Radio City's foyer Tuesday. "It isn't that he's reinvented, it's that the generations have passed him on." Seth Abraham, president of Madison Square Garden and Radio City Entertainment, noted that the show - "Sinatra: His Voice, His World, His Way" - marks Sinatra's 13th time at Radio City (in some form) including five concerts and seven movie premieres. A tearful Tina said: "I know, he knows that we're here." Hart Sharp Video's "Sinatra: The Classic Duets" ($19.99 DVD; $14.99 VHS) spotlights Sinatra singing with Elvis Presley, Ella Fitzgerald, Dean Martin, Bing Crosby and others. The bells and whistles include a half-hour of previously unreleased footage, commentary and stories from the Sinatra family, a trivia track and a feature that allows music to play with no voiceover. While it might seem that Sinatra, a legendary comeback kid, is making a posthumous comeback, Hart Sharp President Joe Amodei disagrees. "I don't look at it as a resurgence. I look at it as a continuation of the popularity that he enjoyed while he was still alive," Amodei said in a phone interview. "I think it's the music and the aura of the man that keeps it all alive - like Elvis and the Beatles." "Mr. S: My Life With Frank Sinatra" by valet George Jacobs was an amazing 80th on amazon.com's Tuesday sales ranking, a week after hitting bookstores. It's a respectful rendering of Sinatra, even though he fired Jacobs in a jealous rage in 1968. Cary Hoffman, a vocal doppelganger whose TV program "My Sinatra" aired during WLIW-TV's pledge drive last week, has "a lot of theories" of Sinatra's enduring appeal. "One thing is it's a backlash against no melodies (in today's songs)," said Hoffman, whose show pulled in enough money June 3 to warrant a primetime rebroadcast Saturday. "Also people want to have a romantic feeling from songs." Another reason is that when Sinatra fell ill about seven years ago, young people started to listen to his songs on the Internet and got turned on to him. And a lot of those twenty-somethings like "to drink martinis, smoke and look cool," suggested Hoffman, who grew up in the '50s listening to Sinatra. "I'm very respectful of what he did for me and that he gave America guts," said Hoffman, who's been in show business all his life and owns the comedy club Stand-Up New York. "He made people see they can do what they want to do and be what they want to be." Even rock 'n' roll stars, as U2's Bono said in an intense, irreverent tribute to Sinatra at the 1994 Grammy Awards. "He has what we want: swagger and attitude. He's big on attitude, serious on attitude, bad attitude," Bono said. "Frank's the chairman of bad attitude. Rock 'n' roll players have been tough, but this guy is boss. The chairman of boss ... I'm not going to mess with him, are you?" The same can be said today about hip-hop stars. Is there any mistaking that Eminem is as much about attitude as he is about music? "He was the quintessential bad boy of popular culture. Elvis and John Lennon and Johnny Rotten and P. Diddy and Eminem - they all owe part of their style to Frank," McAnuff said. "He was tearing up hotel rooms before some of them were born." "In the end, it is of minor interest that Lord Byron swam the Hellespont, that Andre Malraux flew in combat during the Spanish Civil War or that Ernest Hemingway shot lions in Africa. In the end, only the work matters. Sinatra's finest work was making music."